The seeds of Nigella damascena seeds are NOT edible. 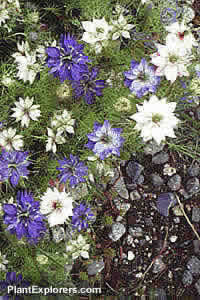 If you're looking for edible Nigella seeds, you will need to grow Nigella sativa. For maximum freshness, please keep seed refrigerated in its original packaging until it is time to plant. Sow seed where it will grow in mid-spring or autumn. Provide protection in winter for autumn-sown plants. Grow in any well-drained garden soil in full sun.